A notification pops up on your iPhone to tell you that someone has called you recently. There is no need to go scrolling through your contacts. You can simply return the recent call by following these steps. 1If you want to dial a number from a call you’ve recently made or received, you can use the Recents call list. You get to the Recents call list by tapping Phone in the Dock on any Home screen. 2Tap the Recents button at the bottom of the screen. 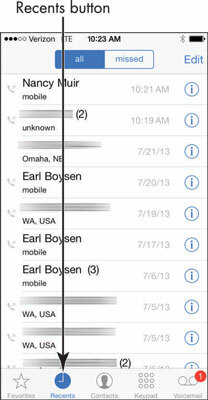 A list of recent calls that you’ve both made and received appears. Missed calls appear in red. 3If you want to view only the calls you’ve missed, tap the Missed tab at the top of the screen. 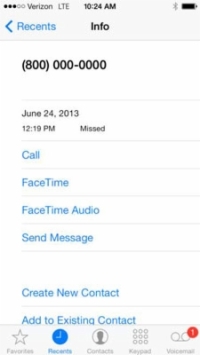 Your missed calls will be displayed. 4Tap the Info icon (a small i) to the right of any item to view information about calls to or from this person or establishment. This will tell you when the call occurred plus some additional information. 5Tap the Recents button to return to the Recents list, and then tap any call record to place a call to that number. Note that with iOS 8, you can access folks you’ve recently contacted using the Multitasking feature. Double-tap your Home button and the Multitasking screen appears with recent contacts listed in a row at the top of the screen. Tap on one and you can then connect by tapping mobile, message, or FaceTime.